Say farewell to Nicky, Ricky, Dicky and Dawn. 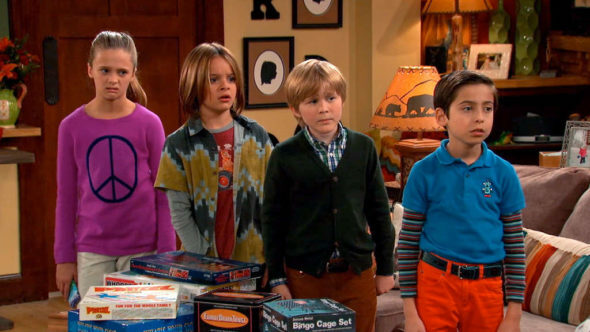 According to The Hollywood Reporter, Nickelodeon has cancelled the TV show after four seasons. The family sitcom centers on a family of pre-teen quadruplets who have little in common. The cast includes Brian Stepanek, Allison Munn, Aidan Gallagher, Casey Simpson, Mace Coronel, and Lizzy Greene. The fourth and final season of Nicky, Ricky, Dicky and Dawn is slated to premiere on Nickelodeon in 2018. What do you think? Have you seen Nicky, Ricky, Dicky and Dawn? Are you sad the show is ending? sad it ended. would have liked to see them grow up more. bad decision on the part of nickelodeon. Why did it end! It was such a great show! It’s sad that the series ended, even though I’ve been watching it for a very long time. And I wanted the Quads to come back for another season. hey..!!!!!!!!!!!!!!!!!!!!!!!! Why r they endind????????? its anawesome show.. while we r on the subject. why do nickelodeon and Disney ch shows all end by like the 3rd or 4th season ? It’s disappointing to see this and School Of Rock: The Series get cancelled. I’m sensing Nickelodeon going through a transition like in 2012.